Hello! Did you see Wonder Woman this weekend? Did you cry? If you answered yes to either one of those questions (or, both) you may proceed. Otherwise, there are Wonder Woman spoilers ahead, and now we’re all going to cry together! The movie — a stellar movie, at that — introduces us to Diana Prince, who is here to save the world. She can certainly do it herself (and, she does), but a nice gentleman by the name of Steve Trevor joins her along the way. Steve, kinda accidentally, gets roped into Diana’s quest for justice and truth. In the end, it leads him to make the ultimate sacrifice when he commandeers a plane and detonates ALL the bombs inside, killing himself (and in doing so, also helps end WWI). All Diana can do is watch from a distance. This moment is very sad in the movie, and yes, I cried (A LOT) watching it unfold on screen. However, it was oddly enough not the first time I’ve seen this scene play out. It was not the first time I’ve seen a guy named Steve fly a plane to his death, leaving his lady-love behind, but dear Zeus, it better be the last time I see it. Obviously, this is also a story about Steve Rogers, aka, Captain America. Because I guess there’s a new trend for Guys Named Steve + Planes in cinema. When Steve Trevor got into his designated bad guy plane, FULL OF POISONOUS GAS BOMBS, I actually growled out loud in the theater, “OH NO YOU DON’T STEVE.” Because, as it is now a thing, as soon as someone named Steve gets on a plane in a superhero movie, that is the end for them. Steve will consequently sacrifice himself for the good of the world, no matter how much they love their lady on the ground, and even if they haven’t had that one dance. To be completely honest, I cry (A LOT) over the Steve + Plane scene at the end of Captain America: The First Avenger. Peggy Carter is by far my favorite Marvel heroine, and it hurts my heart in so many ways knowing that in order for Steve to save the world, she has to lose him. If I think about it too much, I cry even when I’m not watching the movie, not that that’s happening right now. And now, I’ve got another scene with a guy named Steve here to make me cry. In order for Diana to save the world, she has to lose her Steve. This Wonder Woman scene is actually a nice ‘lil inverted twist on Steve and Peggy, but it still hurts just as much. It’s Wonder Woman who’s going to save the world, yet she, as the hero, is not sacrificing herself — it’s Steve. The scenes are different, yet eerily similar. Both are sad, and maybe I’m crying again right now. Do you think in some alternative universe, Diana and Peggy are actually really good friends? Do they talk about their Steves? AND MY GOD, THEY BOTH STEVES HAVE ‘LIL STEVE KEEPSAKES. 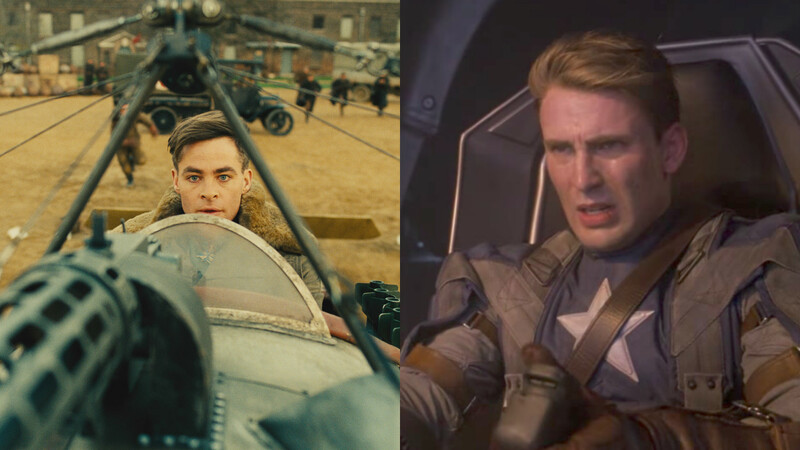 Steve Rogers has his compass with Peggy’s picture in it; Steve Trevor has his watch, which he hands off to Diana. Why must you do this to us, Steves? Basically, what I’m trying to say is that we’ve lost one too many Steves to plane-related incidents recently. Please, don’t anyone let Steve Strange near any sort of aircraft for the foreseeable future.